When you create a new scene, it is usually added after a selected scene, but you can make the new scene appear before it. You can also create a new scene from a series of selected panels within a scene and then separate them as a new one. In the Storyboard toolbar, click the Add Scene button. Each scene is assigned a number. When you create a scene at the end of your project, Storyboard Pro automatically assigns it the number that comes right after the number of the last scene. If you try to insert a scene between two existing scenes, you will be prompted to indicate how this new scene should be named, and if scenes after the new scene should be re-numbered. Select any panel the scene after which the new scene should be inserted. In the Storyboard toolbar, click the New Scene button. Right-click on a panel and select New Scene. In the top menu, select Storyboard > New > New Scene. The Rename Scene dialog appears. If you want the new scene to have a suffix, to indicate that it was inserted between existing scenes, you do not have to edit any of the fields. The New name field already contains the name of the currently selected scene followed by a letter suffix. For example, if you tried inserting a scene before scenes 2 and 3, Storyboard Pro will name the new scene 2_A by default. If you want the scene to have the number after the number of the currently selected scene, and to renumber all subsequent scenes accordingly, enter this number in the New Name field. For example, if you're inserting a scene between scenes 2 and 3, type 3 in the New Name field. 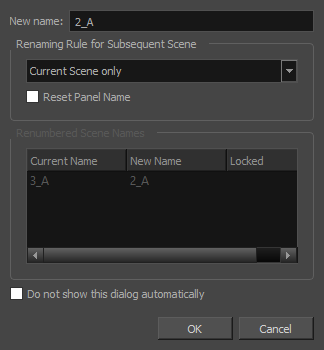 Then, in the Renaming Rule for Subsequent Scene dropdown menu, select Renumber Scenes. If you intend to use the same options whenever you insert a scene, check the Do not show this dialog automatically option. 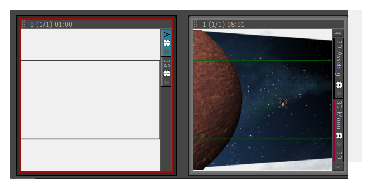 A new scene, containing one blank panel, is added after the current scene, numbered according to your selected settings. Select Storyboard > New > New Scene Before. In the Thumbnails or Timeline view, select one or more consecutive panels. Select Storyboard > New > New Scene from Selected Panels.